We would like to thank everyone who we had the pleasure of meeting at the 2019 World of Concrete show in Las Vegas. As always, this event provides a great opportunity for the Ion Technologies team to meet many new faces, while also allowing us to reconnect with friends and colleagues we have met in previous years. It is always a thrill to meet with professionals from a variety of different industries and to have in-depth discussions on the capabilities of the Ion Technologies controls and complete battery backup sump pump systems. We are also pleased at the positive reactions we received for the demonstration of the second-generation Ion+ Connect (launching later this Spring), a multi-platform communicator that provides multi-monitoring capabilities of the sump pump and surrounding conditions in the basement. At any time and from any place, the Ion+ Connect gives homeowners a head’s up when a potential problem arises, providing ample opportunity to address the issue early, as opposed to potentially coming home later to an unwelcome surprise. Also joining us was our sister brand, Emecole Metro, a manufacturer and supplier of concrete crack repair and basement waterproofing products. 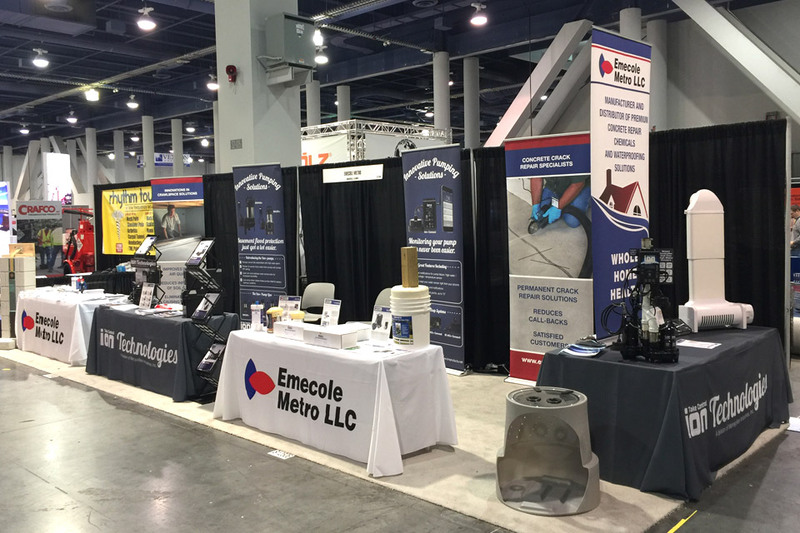 The Emecole Metro team was excited to promote their new hydraulic polyurethane foam pumping system (still in development) that will give contractors the efficient means to raise concrete in sunken surfaces. Our Ion Technologies and Emecole Metro teams look forward to building on some of the new relationships established over the last week, especially as our new product offerings come closer to launch. Didn't Attend the World of Concrete? If we didn’t see you at the World of Concrete, but you’re still interested in learning more about any of our new products launching later this year, we’d love to have a conversation with you! Getting in touch with either the Ion Technologies or Emecole Metro team is just on click away. You can also give us a call at 815-886-9200!